You're all set! 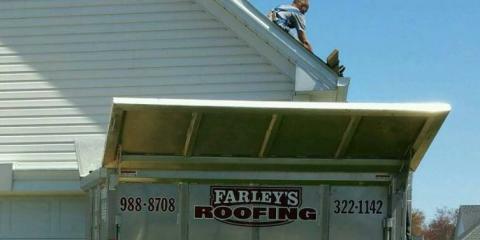 Confirm you want deals for Farley's Roofing in -zip-? When you are searching for a quality contractor to repair or replace your roof, you want someone who is a part of your community. Farley's Roofing in Elyria, OH, has been serving people throughout Lorain County for over 20 years with reliable roofing services and dedication to excellent customer service. As a family owned and operated business, they have maintained a reputation for prompt and professional service. Owner Dan Farley takes pride in his team’s ability to give customers the highest-quality roofing services at affordable prices. With strict attention to detail, the roofers at Farley’s Roofing handle a variety of roofing installations, including: Slate Roofs Slate roofs are known for their long-lasting shingles and sleek appearance. Made of 100 percent natural stone, they are durable and can last up to 150 years or more. They are also fireproof and can be recycled. Decra Metal Roofs Metal roofs can survive high winds, are resistant to fire and shed snow quickly. They provide a more industrial and modern look to homes and businesses. If you have a garage in need of roofing services, they will repair or install a roof to fit your needs whether it is slate, fiberglass or metal. They use high quality roofing materials for each job and guarantee complete satisfaction. Contact Farley’s Roofing, a quality roofing contractor with decades of experience, for a seamless and skilled roof installation for your home or business. Call them today at (440) 322-1142 to set up an appointment or visit their website for more information.